Oyma 3D aims to introduce unique artworks by utilizing the endless possibilities of 3D Printing. Our first project Rocinante Horse Sculpture was made in 2015 to celebrate the 400th anniversary of the timeless masterpiece novel "Don Quixote" by Miguel de Cervantes Saavedra. Don Quixote has been published and translated more than any other book (except for the Bible). Don Quixote's horse "Rocinante" was not just an ordinary horse, but he was to him the resemblance of the super horse that a heroic knight like Don Quixote can rely upon in his legendary battles like when he fought the giants (the famous fight with the windmills). A horse like no other this is how we wanted this sculpture to be; an intricate, unique piece that suits a magnificent knight like Don Quixote. It took Don Quixote four days to find an appropriate name for his horse, because (as he said to himself) "It was not right that a horse belonging to a knight so famous, and one with such merits of his own, should be without some distinctive name..." So he decided to call his horse Rocinante, which means in Spanish "The foremost nag in all the world". Rocinante 3D-printed edition is made of flexible white nylon plastic with a matte finish and slight grainy feel. The bronze edition is made of premium quality bronze alloy. "Thou hast seen nothing yet" is a quote from Don Quixote engraved on Rocinante's horseshoe shaped base. "Oyma 3D’s stunning 3D-Printed Sculpture of Rocinante is anything but a nag." "Al-Swedy’s beast freezes in majestic mid-gallop with a 3D-printed body that resembles the delicate designs of woodcuts." "Intricate, unique, and complex, serving as not only as a thing of impressive geometric beauty, but also as great symbol for the intricacies of Cervantes’ writing, complete with allegory and symbolism galore." "Not merely just a 3D printed horse but rather, a complicated geometric structure." "Rocinante “A Horse Like No Other” Don Quixote of La Mancha’s Horse." "It is not just simply a 3D printed horse but rather a complicated geometric structure similar to Joshua Harker's 3D printed skull, Crania Anatomic filigree." "A stunning tribute to the foremost nag in all the world." 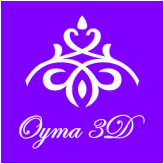 Copyright © 2019 Oyma 3D, All Rights Reserved.